Don a VR headset, jump on a playground swing and be transported inside an experimental virtual reality ride mechanism, chosen from the growing collection created by the world’s only Thrill Engineer, Professor Brendan Walker, and his team of Thrill Laboratory technicians. 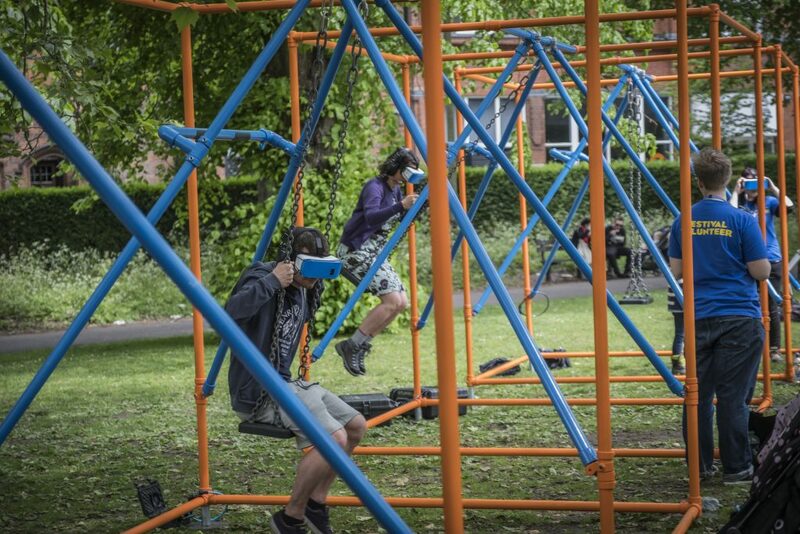 VR Playground is a touring, immersive, kinetic installation based on two popular entertainment technologies: the multi millennia-old swing and the 21st-century virtual reality (VR) headset – the former designed to excite the vestibular system, the latter designed to excite the visual cortex. Swingers enter highly emotive, abstract and dynamic visual worlds that are activated, and reinforced by their swinging motion. Swingers become performers in architectural space, attracting and entertaining growing crowds of spectators. Each site-specific installation can feature up to twelve VR-swings. Thrill Laboratory and the Thrill Engineer are creations of artist Brendan Walker. Thrill Laboratory is a collective of artists, designers, engineers, scientists and technologists who, under Walker’s direction over the last ten years, have been perfecting the art of creating, producing and examining new forms of thrilling experience.